Two fenced acres nestled in a peaceful little valley with dramatic views. You're out of town, yet just 4.5 scenic miles along county roads and Junction Creek, from Main Street, the Durango Recreation Center, Senior Center and the River Trail. Relax on your choice of decks or flagstone patios while your kids and dogs roam safely throughout fruit trees, gardens and wide open space, all within 2 completely fenced acres. Unwind in 6-person hot tub, secluded with views. In less than 5 minutes you'll be at the Colorado Trail trail head (which continues to Denver) and Junction Creek; the uncrowded San Juan National Forest meadow trails are 2 minutes away. A 30 minute drive to Purgatory Ski Area. Single story home has open floor plan flooded with natural light, big windows and a view from every room, house plants, cork and tile flooring. Master bedroom has queen bed and master bathroom with tiled walk-in shower and soaking tub. Second bedroom has queen bed. Third bedroom has a queen and full size beds. Ceiling fan in every bedroom. T.V. room has sunny window seat (optional bed), 42' LED T.V. Second bathroom includes large tiled walk-in shower. Family room has cathedral ceiling with fan, twin futon couch/bed, desktop computer and games. Keywords: single-story house, fenced property, extra-large carport with workbench and storage space, 4.5 miles from Main St. I am a retired school teacher. The house you are viewing is my home. It is where I raised my 2 children and continue to live. 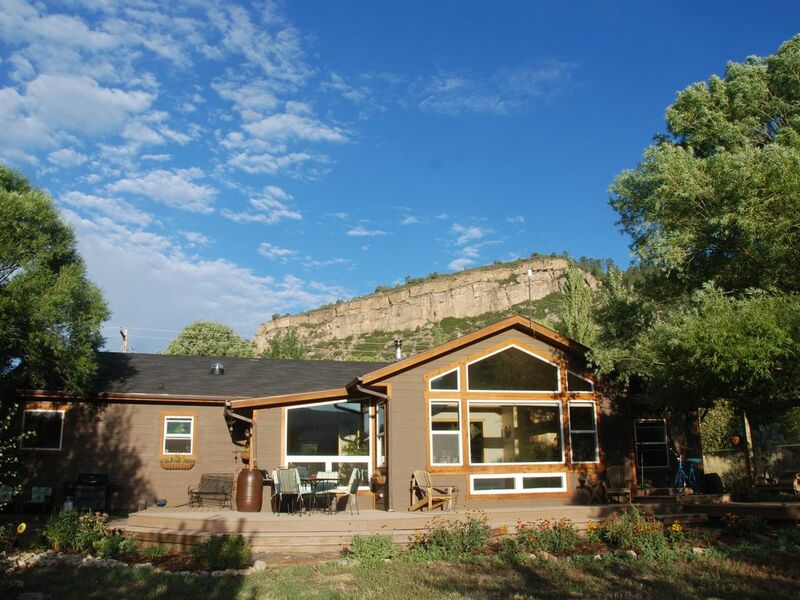 I take full advantage of all the outstanding outdoor activities in and near Durango. I love the location of my house. it is only 4 miles from Main Street yet access to National Forest is only minutes away. The views are awesome and the valley is peaceful and quite. Nice home with everything you need for a comfortable stay. The house is out of town a bit but easy to find and really makes you feel like you are in the mountains. Great views of the mountains from the house and decks. Amazing vacation, we stayed busy even with all the snow!! This house is beautiful and decorated lovely. The hot tub was a hit! Our family had a wonderful time at this cottage. Everything was perfect. We truly enjoyed our time at this property. The home was clean, serene and the views are beautiful. The house was perfect for our group and very comfortable. We definitely would stay here again! Great house, views, and location! We stayed here for a week and had a fantastic stay. Comfortable home, great views from the deck, and the location near the CO trail and the Falls Creek area was perfect. Mark’s place was absolutely perfect! It was everything we wanted in a vacation home - beautiful views (360), close to town but not too close, outdoor space for kids (and adults) to play, spacious, CLEAN and well-appointed interior. We highly recommend this place (except for around this time next summer when we want to come back- ha!) Thanks for opening your home to us- we felt right at home here!